A peek at the menu, the beauty of the setting, and the lessons learned from experience and skill. 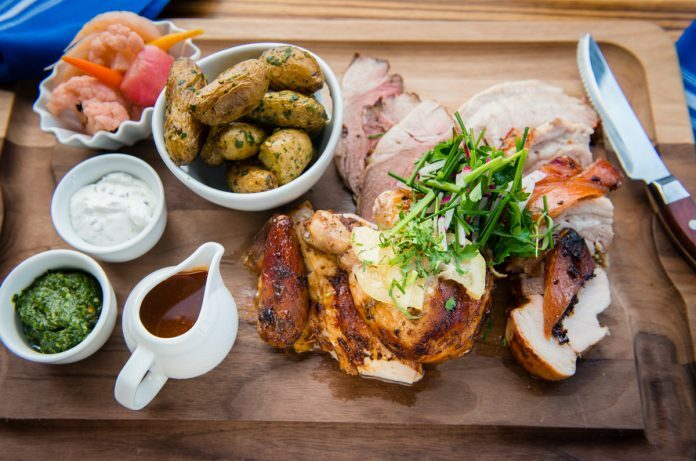 Hendrix Rotisserie Platter features lamb, porchetta, chicken and potatoes. Is it possible for eyes to feel hunger? Look through the spacious front window at Hendrix, and the sight will make your peepers ravenous. Trust me. The recently opened Laguna Niguel restaurant showcases a tall French rotisserie to the left of the front door, its bounty mouthwateringly browned and caramelized to perfection. The turning process sets up a captivating rhythm—rotating poultry, lamb, and pork to expose each juicy surface to the heat. The top revolving skewer corrals plump chickens side by side. Brined for two days before spearing, the four-pound birds are judiciously basted with a mixture of fresh lemon juice, garlic, extra-virgin olive oil, fresh herbs, and spices. An alluring crust is created, the flesh underneath moist and flavorful. A vibrant lemon confit is served on the side. This citrus garnish requires two months to perfect, the thinly sliced lemons mingling with sugar, juice, and lemon pepper for its 60-day nap interrupted by occasional stirring. Just below, a gentle drip-drip-drip of chicken juices falls onto thirsty potatoes held in a basket attachment; they are thumb-length beauties with yellow flesh from Weiser Farms. 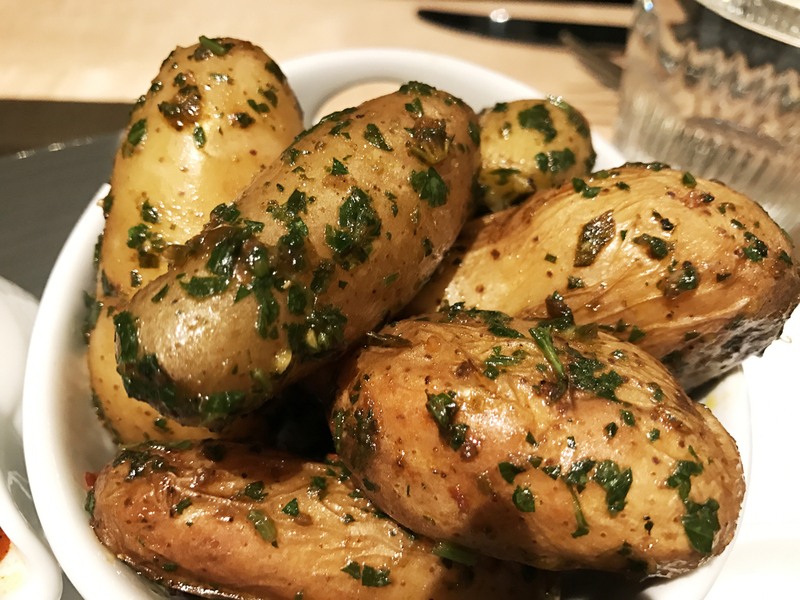 Before service, the dripping-spiked spuds are tossed with chimichurri. One skewer down, lush porchetta performs its rotation; skin-on pork belly wraps around pork loin, the exterior becoming super crisp with its just-right exposure to the heat. A delightful hint of anise is absorbed from brining. Slices are accompanied with pickled vegetables, a mix of radishes, cauliflower, and fresh fennel that add brightness with their acidic counterpoint. On the bottom spear, a luscious Colorado leg of lamb takes it turns. It’s boned except for the shank and rubbed with a mixture of whole-grain and Dijon mustards. Milder than New Zealand or Australian lamb, the scrumptious meat is served pink and thinly sliced with lebni on the side. Made by straining a mixture of yogurt, sour cream, and salt, the creamy lebni is augmented with minced cucumber and chopped dill. It’s like Greek tzatziki, but thicker and richer. 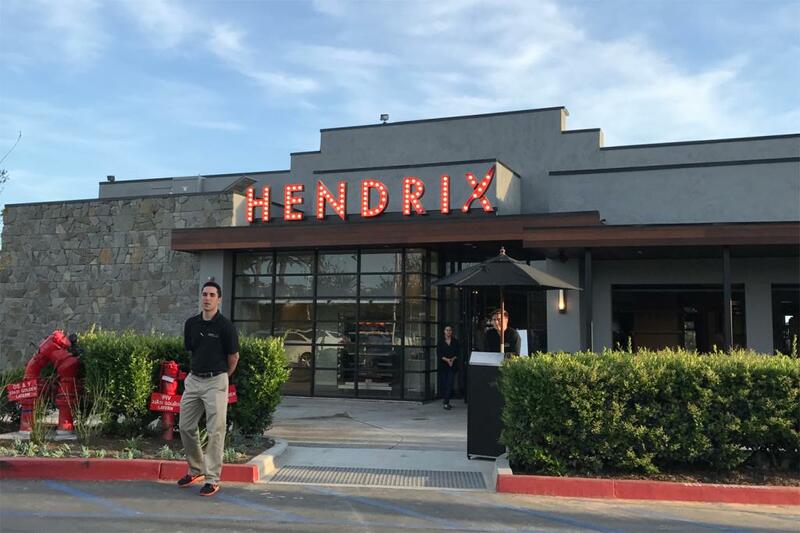 Rainer Schwarz, executive chef-partner, said Hendrix aims to be a neighborhood restaurant with honest delicious food, great service, and value. A rotisserie platter showcasing chicken, lamb, porchetta, and potatoes (plus all those flavor-amped garnishes) is priced at $25 per person. It’s available both in-house and for takeout. Impressive, but it’s just one of many delectable menu offerings categorized as “New American Cuisine”—dishes honed with hard work that required testing and re-testing month after month before opening April 8. According to Schwarz, New York chef-restaurateur Jonathan Waxman is the godfather of New American cuisine, a culinary approach that uses simple ingredients to make perfectly executed dishes. He says the lobster tastes like lobster, the salmon tastes like salmon. Nothing is masked or muddled. Schwarz has a well-established reputation in Orange County for his delicious menus. Along with John Nye and Colby Durnin, partners in the Sentinel Restaurant and Hospitality Group, they form the team behind Driftwood Kitchen and The Deck restaurants on the Laguna Beach coastline. The new 180-seat eatery shows off a creative design that is stunning and welcoming, an all-embracing remodel of Fred’s Mexican Cafe, which previously occupied the location. The enclosed patio area is lined with large bi-fold widows that open to a vista of trees, foliage, and on a clear day, a glimpse of the Pacific Ocean. Forced-air heating assures guests of a chill-free experience. There’s a glassed-in private dining area, as well as a retail wine shop where diners can purchase a bottle to take to the table. Comfortable booths, scattered throughout, are crafted from fabric that has the feel of a well-loved baseball glove. A showy bar is in the center of the dining room. It boasts a dropdown beer tower that provides six craft beer choices. There’s a large selection of wines by the glass, as well as an array of alluring cocktails. The restaurant’s name honors Hendrick’s gin, so it seems fitting that the spirit is featured in The Perfect G & T. This refreshing cocktail, served in a stemmed white wine glass, features Fever-Tree tonic water and botanicals, including juniper berries, cucumber, and flowers such as rose petals and borage. 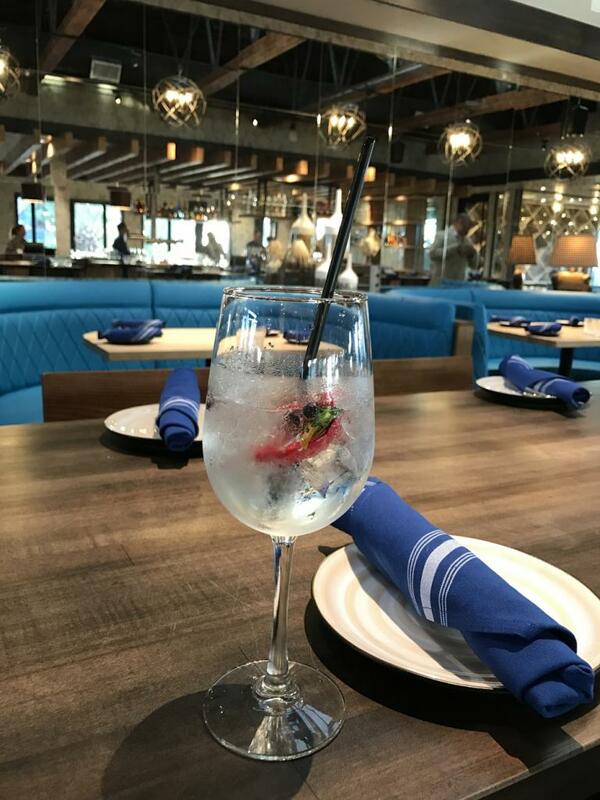 Off the bar, a cozy lounge areas seem the perfect spot to leisurely enjoy some wine and a plate of grilled Spanish octopus drizzled with harissa olive vinaigrette. There’s a good dollop of hummus on the side making the dish rounded and satisfying. 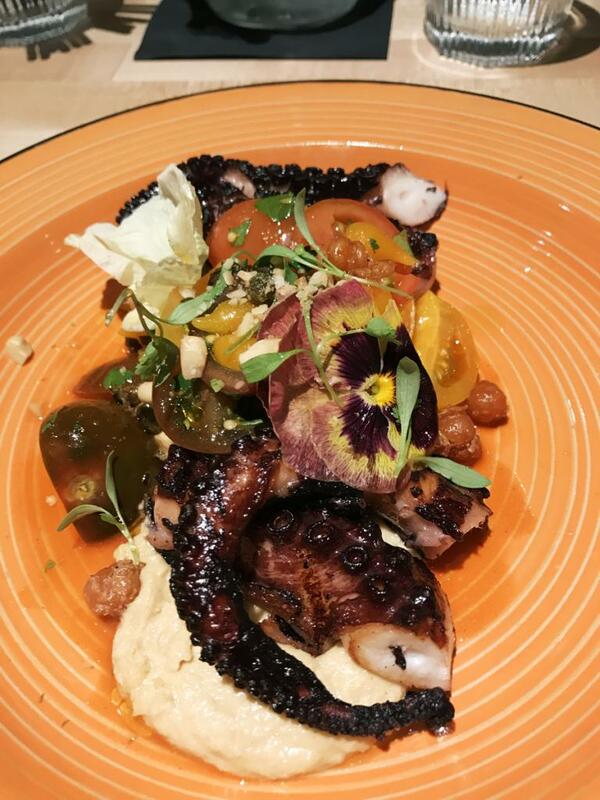 Schwarz is a master at grilled octopus; it’s masterfully prepared to make the texture oh-so tender, while creating a crisp-yet-light char on the exterior. Try the chicken flatbread. 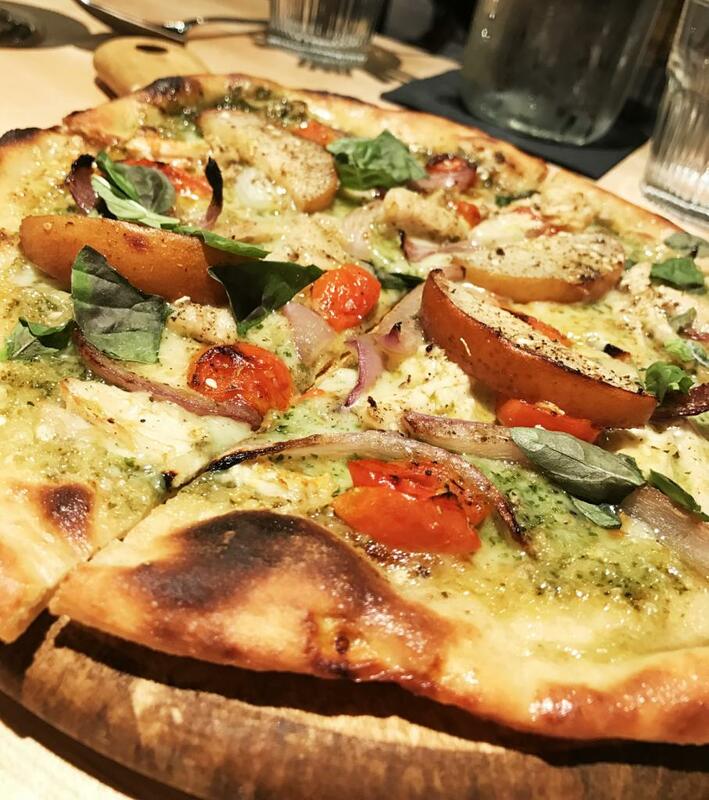 Along with chunks of chicken, it’s topped with roasted garlic, basil pesto, spices, and fontina cheese, as well as diminutive currant tomatoes. The crust is divine—thin and crisp. He credits his spice purveyor, Le Sanctuaire, for providing products that are full of flavor and aroma, adding that their zaatar helps to make the flatbread delicious. Don’t think of leaving without dessert. Pastries for all three restaurants are made here, and if you are an apple fan, the strudel is a must. Austrian-born Schwarz knows exactly how to prepare the perfect rendition of the classic Viennese treat. 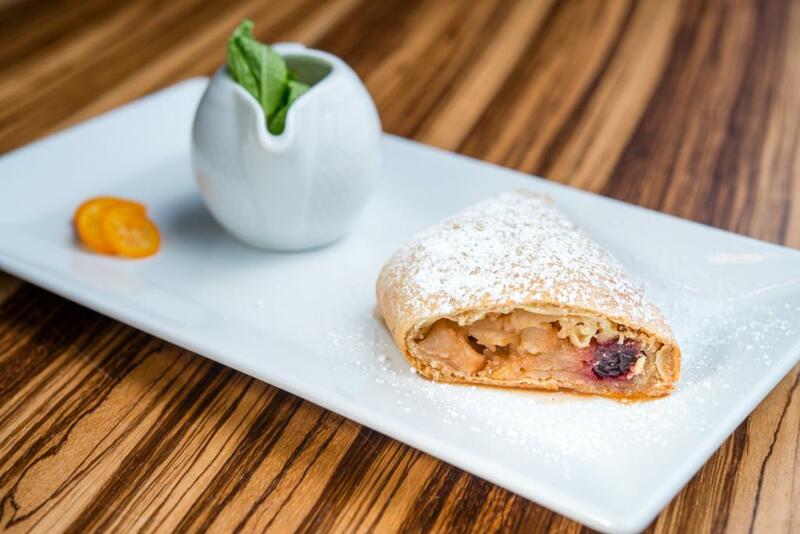 The filling is made with Gravenstein apples, aromatic fruit that is filled with sweet-tart flavor and ample juice. There are generous portions of golden raisins cooked in rum, as well as breadcrumbs, lemon zest, and ground cinnamon. It’s served with a small pitcher of crème anglaise, sauce that is pourable custard. “I want Hendrix to be about the neighborhood,” Schwarz said. “I live a mile away. Neighbors will text me for reservations, or they will tell me if things aren’t right. Hendrix is at the Ocean Ranch Village in Laguna Niguel, 32431 Golden Lantern, hendrixoc.com.